NB. 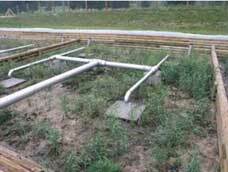 This fact sheet supplements fact sheet A17 "Various ecological effluent treatment solutions"
Constructed wetlands are involved in several effluent treatment systems presented in fact sheet A17. They contribute to removing organic matter and impurities from wastewater. They are sometimes called "constructed wetlands". Their principle involves causing water to flow through a gravel filter on which macrophyte plants (aquatic plants), such as reeds are grown. Their roots carry oxygen to the soil and create an environment conducive to the development of water-purifying micro-organisms. In some way, the process reproduces the natural water purification process in marshes in which wastewater begins to settle by discharging its solid particles and then undergoes natural physical, chemical and above all biological treatments favoured by aquatic plants that have the effect of degrading organic matter, removing nutrients associated with particles and significantly reducing pathogens in wastewater. As the process lowers the water to the bottom of the hole dug in the ground which contains the filter, use must be made either of a sloping plot of land or a pump to raise the water to ground level to recover it and feed it to the next processing stage. There are two types of filters : horizontal and vertical. They differ in their feeding method, the water flow direction and the aerobic treatment conditions. Vertical filters require an intermittent water feeding method and use fairly complex biological mechanisms enabling them to significantly reduce pathogenic germs and the BOD. Horizontal filters require the water to be pre-treated, for example, by a vertical filter, septic tanks or a small lagoon to avoid clogging risks. They are more suitable for wastewater containing relatively little solid matter. These filters are generally incorporated into a set of treatment systems that can be used for domestic water treatment at family or community level and which can replace cesspools or septic tanks. Vertical filters are not fed continuously, but by intermittent scoops (see fact sheet A18 "Systems for spreading wastewater by tanks"). When a scoop arrives, water is distributed on the filter surface and then percolates evenly. It is recovered from the bottom of the filter, at a depth of about 80cm, by means of a discharge drain. Sludge will accumulate on the filter surface to a thickness of about 1.5 cm per year. The stems of macrophyte plants pierce the layer of sludge and prevent it clogging the filter. Two to three identical filters are generally arranged in parallel and operate alternately. The scoop system must be designed so that each scoop covers the filter with a layer of 2 to 5 cm of water. Ideally, the filter should receive 6 to 12 scoops a day. - the flatness of the filter surface : stones should be placed under the water inlets to prevent the occurrence of holes or washouts dug by the water jets. 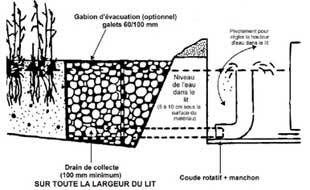 When designing the spreading system, provision should be made for the fact that a layer of sludge will settle to the filter surface (up to fifteen centimetres thick, see "Maintenance"). In particular, the water outlets should be sufficiently high above the filter surface. The water is discharged through discharge drains which should be located at the bottom of the filter without being vertically in line with a water inlet, so that the water passes through a maximum distance in the filter. Each filter should have alternating operating and idle phases. For some small systems (fewer than 100 inhabitants), an operating phase of 3 to 4 days, during which the filter is fed by scoops, can be alternated with an idle phase lasting the same time. This thus requires two filters : one being idle while the other is operating. In the general case, it is preferred to alternate one operating phase lasting three to four days with an idle period twice as long. This thus requires three identical filters : one operating while the other two are idle. The filter bed is installed in a hole dug in the ground. 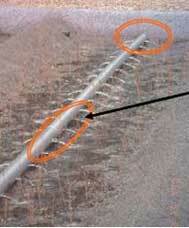 It must be sealed to prevent water that has not yet been treated from seeping into groundwater. It should be between 50 and 70 cm deep. Top layer : 30 cm of fine gravel (2 to 8 mm in diameter), sometimes placed below a thin 10 cm layer of sand. When two sets of vertical filters are used in sequence (as in the case of system No 2 referred to in fact sheet A17 on the various environmentally sound effluent treatment methods, the top layer of the second filter should preferably be made of sand. When the filter is started, 4 macrophyte plants should be planted per m² with their clods. They will multiply during the filter’s operation. To ensure the filer’s proper operation, ventilation shafts connected to the evacuation drains must be installed, making sure that they emerge high enough to prevent water from going down this way. (see diagram on page 1). Evacuation drains must be installed at the bottom of the filter without being vertically in line with a water inlet, so that the water passes through a maximum distance in the filter. Macrophyte plants should be pruned once a year, leaving a height of 30 cm to prevent plants from being submerged by the scooped water. If weeds grow in the filter, they should be pulled out by hand as soon as possible and removed from the filter. The filter’s proper operation should be monitored regularly to ensure in particular that the filter does not become saturated and that the drains do not become clogged. As a guide, sludge normally accumulates on the filter’s surface at a rate of about 1.5 cm per year. The sludge accumulation should be monitored regularly to make sure that it does not disrupt the filter’s operation : spreading system, ventilation shafts, water distribution, etc. When the sludge layer is about fifteen centimetres thick, it should be removed. It can then be reused as agricultural compost. The horizontal filter fed continuously or otherwise by scoops. Its operation does not require a system idle phase. It is thus generally not necessary to install several filters in parallel. Water flows horizontally and is purified by micro-organisms that attach themselves to the roots of macrophyte plants. There is a very high risk of the filter clogging if the water has not been pre-treated. The horizontal filter should thus not be used at the start a sanitation system, but should be preceded by a primary treatment system, for example, a vertical filter or decanter (see fact sheet A19 "Settlers/digesters"). Cylindrical baskets, containing pebbles and used for the purposes of transition between the filter medium and the system’s pipes, are placed at the filter inlet and outlet. Their purpose is to ensure a water distribution over the whole width of the cylindrical basket. A simple system is used to regulate the water level, which should ideally be maintained 5 to 10 cm below the filter surface. The filter bed is installed in a hole dug in the ground. It must be sealed to prevent water that has not yet been treated from seeping into groundwater. It should be about 50 to 60cm deep, in other words, less deep than vertical filters. It is composed of gravel with a grain size of between 4 and 8 mm. If the treated water contains too many very fine particles, the filter may become irreversibly clogged. The bottom of the filter must have a slope of about 5%, to avoid water stagnation. When the filter is started, 4 macrophyte plants should be planted per m² with their clods. They will multiply during the filter’s operation. Their role is to supply oxygen to the filter bed and allow the fixing of micro-organisms. Through a series of physical, chemical and biological processes, solid particles settle, organic matter is degraded and nutrients clinging to particles such as nitrogen and phosphorus are degraded by micro-organisms attached to the stems and roots of plants. The filter’s proper operation should be monitored regularly, once a quarter, for example, to ensure in particular that the filter does not become saturated and that the drains do not become clogged. Macrophyte plants should not be cut down. Simply remove dead leaves and branches, which may encourage the growth of weeds if they remain in the filter. Unlike vertical filters, no layer of sludge forms on the surface. This is the system No 3 referred to in fact sheet A17. The horizontal filter needs less of a slope than the vertical filter. Two to three metres level difference is sufficient for this system. It is important for the water to flow first through the vertical constructed wetland : this stage is needed to prevent the horizontal filter clogging. This system is more effective than a system involving installing two vertical filters in series to remove germs from faeces. It should thus be preferred for black water treatment (domestic wastewater + faeces + urine). Variant of this system : replacement of the scoop system and the vertical filter by a settler, which allows it to be installed on a plot of land with a level difference of a metre and be used without a pump on a less sloping plot of land. 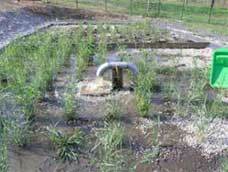 - Constructed wetlands require relatively little maintenance. - They provide an environmentally friendly and more aesthetically appealing solution which, in general, does not give off odours. - They are well suited for small towns or suburban areas. - They are fairly cheap to build and their operating costs are very low. - Constructed wetlands require either a relatively large and slightly sloping plot of land or a pump to raise the treated water to ground level. - They are not very effective against nitrification and phosphatation. They also only provide partial treatment and must thus be associated with other systems. - They need to be designed by specialists. - Vertical filters should be fed by a scoop system. - Horizontal filters may be clogged if the incoming water contains too many solid impurities. It is particularly relevant to express cost as an order magnitude expenditure per household. number of users, but only €3 or €4 per household per year to operate. - PDM and PSEau SMC Methodological guide (concerted municipal strategies) : "Choosing suitable technical solutions for liquid waste disposal", which is a very interesting and informative 136-page illustrated guide produced by GRET, pages 109 to 115 deal with the issue of sludge treatment.